The passion for naming things is an odd human trait. Many a scientist claims to have explained some phenomenon when in truth all he has done is to give it a name. Gertrude said it most succinctly and perhaps most elegantly. A thing is what it is, not what it is called. Yet, the ancient Chinese proverb — The beginning of wisdom is to call things by their right names — intimates that words do matter. Perhaps the Chinese were conflating wisdom with knowledge, for clearly names are important in knowledge whilst wisdom tells us that a rose is indeed a rose. 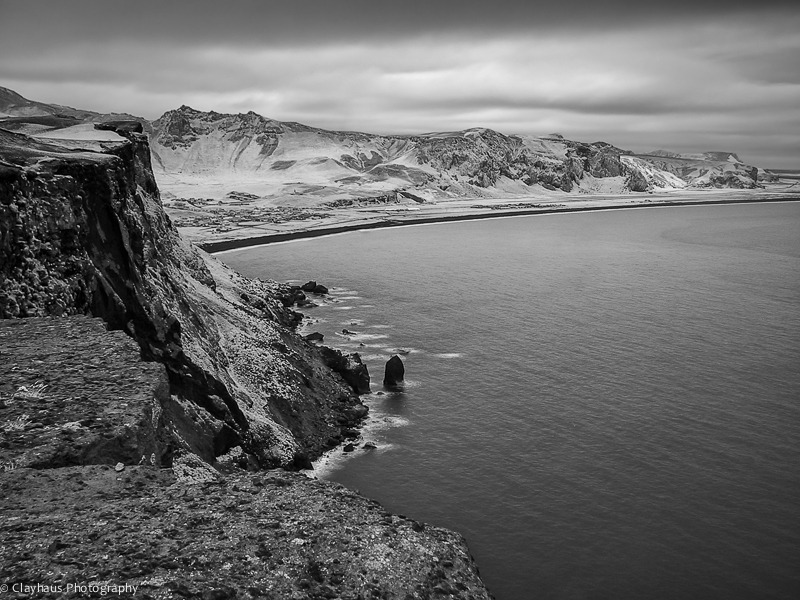 Recently I began reprocessing images of a trip to Iceland I took some years back. I started labeling the images with more specificity than just “Iceland,” and began wondering about Mýrdalsjökull, Hjörleifshöfði, Reynisdrangar and other tongue-twisting place-names I was finding on my maps. Is there a history behind the name? Does the name mean something? Is a rose truly just a rose? 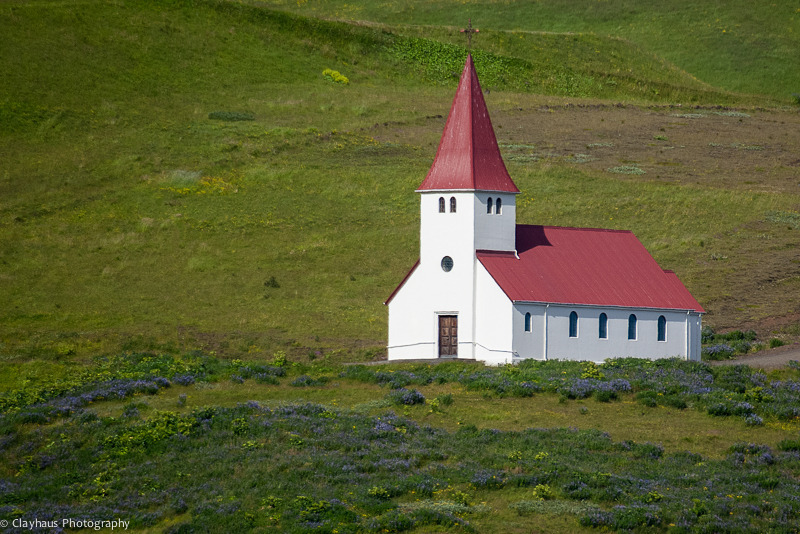 Or, in the case of Iceland, is a vík a vík. 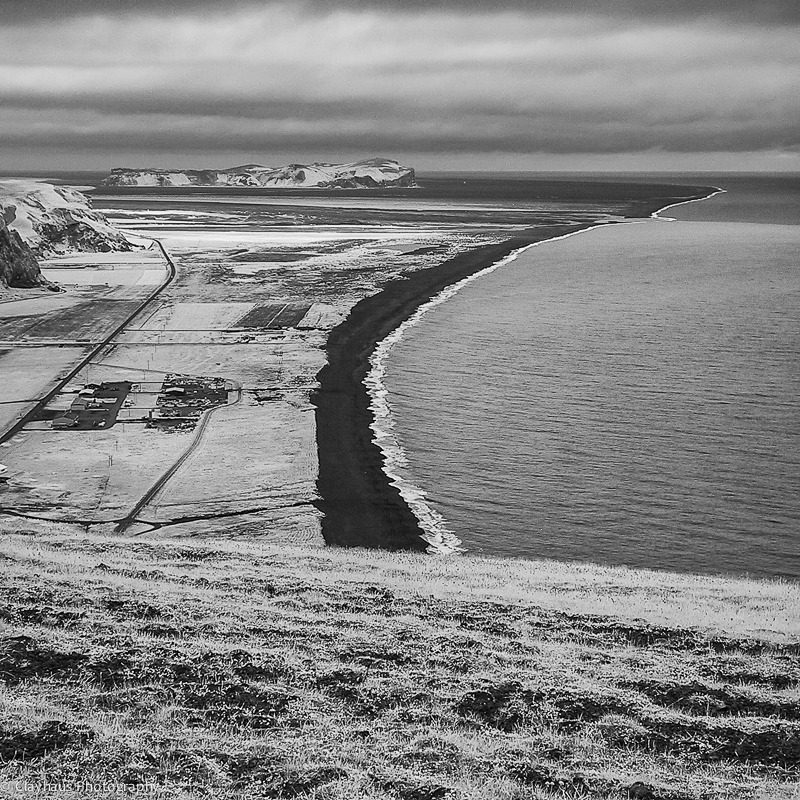 Some 15 kilometers east of Vík is the isolated 220 meter high headland of Hjörleifshöfði. Named after the Viking Hjörleifur Hróðmarsson, who settled there in 874, the small mountain was once a much larger promontory. 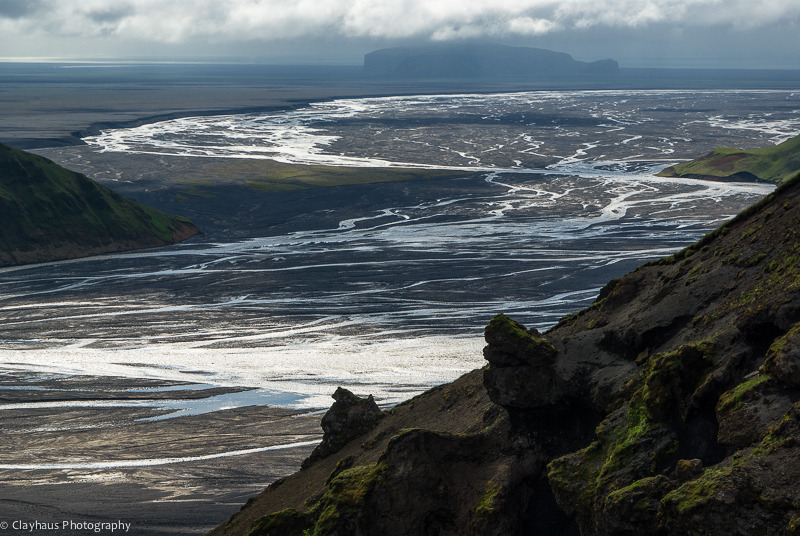 Successive eruptions of the mighty Katla over the eons has caused so much flooding and carrying away of rock that Hjörleifshöfði stands isolated, a mile and a half from the sea. Returning to Mr. Hróðmarsson, apparently he was not a good provider as a year after settling on the rock his slaves revolted killing him and his free men. He is said to be buried at the highest point of the hill. His farmstead was clearly visible next to the rock for over a thousand years until the 1918 eruption of Katla finally washed away the remnants. 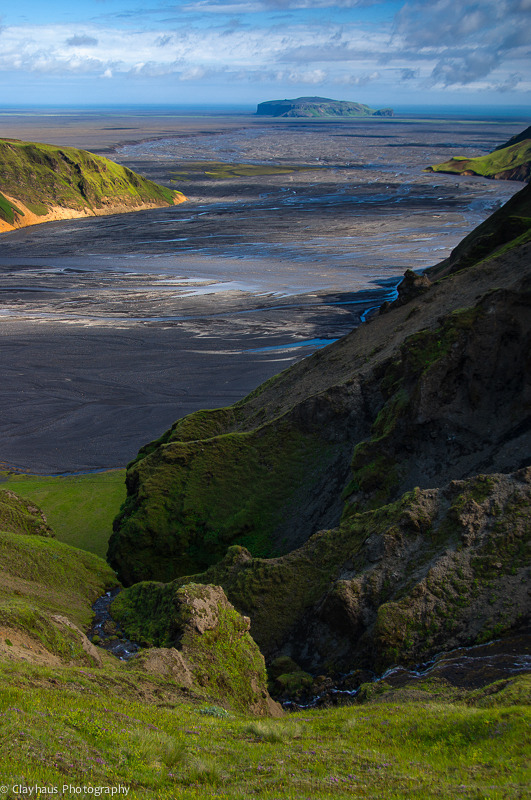 The cause of all these volcanic disturbances lies some 20 kilometers north of Vík (as the puffin flies). Katla (derived from the Old Norse word for ‘kettle,’ the shape of which upside-down the volcano is) is a large, very active volcano partially covered by the Mýrdalsjökull glacier. It has erupted 20 times since 930 AD and is due for another, any time now. The flood waters created by one eruption is estimated to have been comparable to the combined output of the Amazon, Mississippi, Nile, and Yangtze rivers. Not something one would like to be caught in. In old days, traveling along the southern coast was greatly feared because of the deep rivers and frequent glacial floods. In July of 2011 there was a small eruption on Katla that created a jökulhlaup (glacial ‘leap’ or glacial outburst flood) that destroyed the bridge across the main highway. Watch this short video and at the :34 mark you will see Hjörleifshöfði in the distance.